Welcome to "I Love Virginia Beach . Com"! 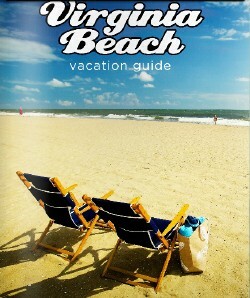 Your premier guide to all that makes Virginia Beach such a great place to live and vacation. Everyone is searching for the perfect place to get away from it all... or to call home, and Virginia Beach ranks high on both accounts. The Hampton Roads area offers more than 29 miles of beaches, and Virginia Beach alone boasts 14 miles of pristine shoreline. But if you think that’s all Virginia Beach has to offer, you're in for a pleasant surprise. Promoted as a year round destination, Virginia Beach is rich in history, culture, natural beauty and is host to hundreds of boardwalk and local activities sure to please sports enthusiasts, outdoorsmen, historians, and beach lovers of all ages. If you're a vacationer or newbie, the most difficult part is deciding what to do first when you arrive. The shoes are the first things to go... and naturally the kids have hit the beach! But then it starts. Decisions... decisions... With miles of sand, surf, activities, and restaurants to choose from, your vacation itinerary will be filled to the brim. There are so many attractions and activities to explore, it's hard to pick just one. There are dozens of lodging options from quality Hotels, Motels, and B & B Inns near the resort area. 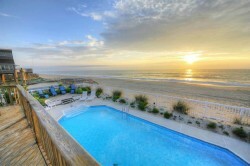 Or perhaps you want to spread out and relax with the entire family in a fully furnished Vacation Home Rental or Condo. We even offer several Pet Friendly Rentals (hotels and vacation home rentals), so that your four-legged friends (dog, cat) can join in all the fun! Are you more of a outdoor lover? 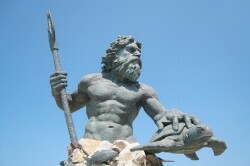 Virginia Beach offers a variety of Campgrounds surrounded by the sights and sounds of nature. Our city is also a perfect place to plan a romantic Beach Wedding along the shore of the Atlantic (also plan your a Rehearsal Dinner, Bachelor / Bachelorette Party, or Honeymoon). No matter what your looking for, our first class hospitality industry and local business services can meet your every need. The ever popular oceanfront Boardwalk overflows with excitement, from quaint Shops & Restaurants to music and entertainment. Residents and tourists alike love to stroll, jog, bike, roller skate or skateboard along the boardwalk as they take in the award-winning landscaping sprinkled with colorful flags, teak benches, whimsical bigger-than-life art sculptures including the huge Norwegian Lady and King Neptune statues. During the summer, Atlantic Avenue turns into Beach Street USA and transforms itself into a little bit of Key West FL / Mardi Gras with fireworks displays, performers, musicians, jugglers, as well as live bands and entertainment at the 17th and 24th Street stages. Whether there's a surfing, soccer or volleyball championship, art show, sandcastle contest, live concert with big name performers, or a holiday festival going on... everyday is special on the Virginia Beach Boardwalk. Virginia Beach and other local cities arehost to major events every week at different venues such as the Virginia Beach Convention Center, Farm Bureau Live (Va Beach Amphitheater), Sandler Center for the Performing Arts, Contemporary Art Center of Virginia, Scope, Constant Convocation Center, The Norva, Hampton Coliseum, NTelos Pavilion. The kids will love a fun day riding the water slides, wave pools, and more at Ocean Breeze Water Park with it's Carribbean theme atmosphere. 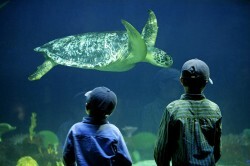 Or you can head over and explore the wonders of nature at the Virginia Aquarium and Marine Science Museum, which is one of the Top Ten aquariums in the country. This museum offers hundreds of interactive "hands-on" exhibits, as well as 800,000 gallons of aquariums showcasing sharks, stingrays, sea turtles, river otters, in addition to having an outdoor aviary and a 1/3 mile outdoor nature trail. They even have guided dolphin or whale watching boat tours - a local’s favorite. We also have some new attractions such as Adventure Park (zipling in the trees), Horseback Riding on the beach, as well as IFly, which is a wind tunnel, simulated sky diving experience. FUN is what Virginia Beach is all about! Anglers flock to this area for some of the best fishing in the country! 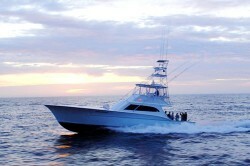 Hop aboard a sightseeing cruise or head boat for in shore fishing... or head out into the great Atlantic on a charter boat (with a licensed Captain) for an exciting deep sea fishing expedition. If you're more of a land lubber - there are several fishing piers scattered throughout the city. Perhaps a few rounds of golf with your buddies is your idea of a “perfect day”. Virginia Beach offers nearly 30 top-notch Golf Courses to keep golfers well challenged. 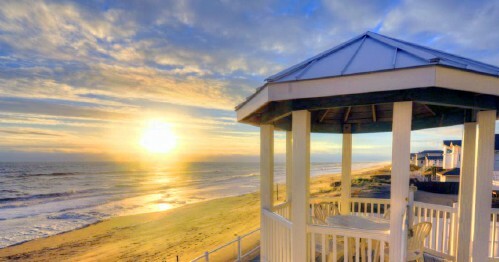 Of course, when it comes down to it, Virginia Beach is all about "the beach.” This beautiful city offers the perfect backdrop to slow down, relax, and take in the breathtaking Atlantic vistas. 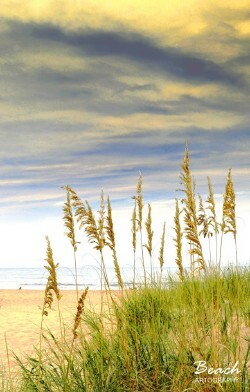 There are so many beautiful and secluded sandy beaches and city parks to escape to. Folks love it here because the locals are friendly, the living is easy, and on any given day, you can close your eyes, breathe in the aroma of salt air, and listen to the sounds of gulls overhead. Yes, our magical city offers a peaceful respite where a simple stroll along the shore can wash away everyday problems, and put your life back into perspective. And it’s those quiet moments that rejuvenate the soul and keep vacationers returning and residents happy year after year. Hope to see you at the beach! 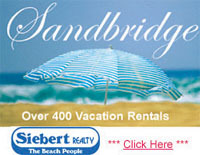 We get alot of requests for a printed brochure, but unfortunately, ILoveVB.com does not have one we can mail to you. Everything we provide to the vacationer is here on our website. Feel free to browse through this guide or you can call the city directly at 1-800-VABEACH with questions or to have a brochure mailed to you. 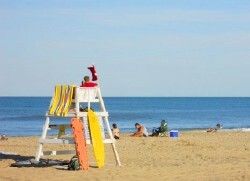 Or visit www.visitvirginiabeach.com. GOOD LUCK!